Love! Great material and weight! Worth the money if not more! They are comparable to 200 per panel curtains I bought from a high end retail store. I will be buying more for other rooms! "Faux Silk Dupioni Curtains are uniquely lustrous with a distinct texture that mimics textured Dupioni silk. 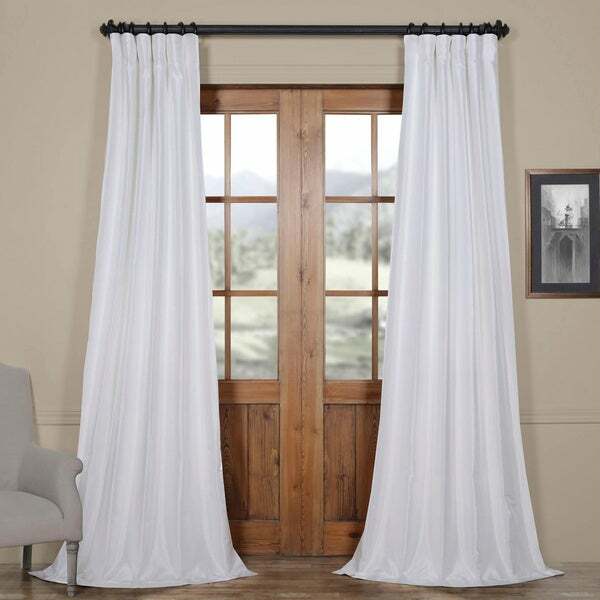 These curtains offer you luxury with the affordability and durability of a faux fabric. Built-in are two header designs within a single panel: attached back tabs for a more formal pleated look and traditional pole pockets." 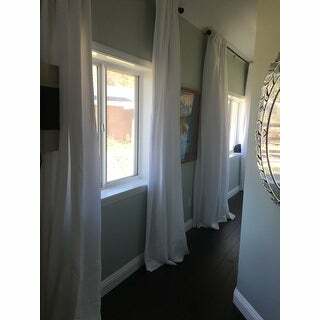 These drapes are very white with a cotton lining in back which provides privacy. I have them hanging in my dining room and they look really nice and the quality is almost as nice as my real silk dupioni drapes at a fraction of the cost. I highly recommend these to anyone who wants to add a touch of elegance without breaking the bank. These Dupioni Silk curtains are thick long and well constructed. They are slightly shiny, but look like very expensive custom made curtains. They even have weights at the the bottom, and a black liner built within. 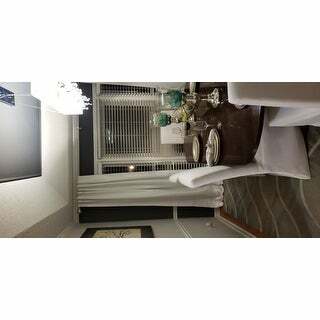 I highly recommend them if you are looking to decorate a room with fancy window panels. If you are trying to completely darken a room, consider then buying a darker color. 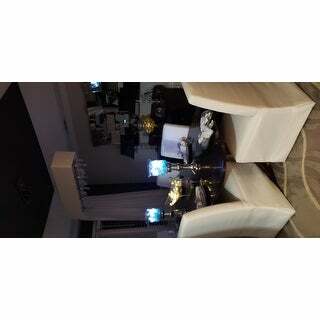 Overall, these curtain are long, luscious, well made and very affordable. I highly recommend. 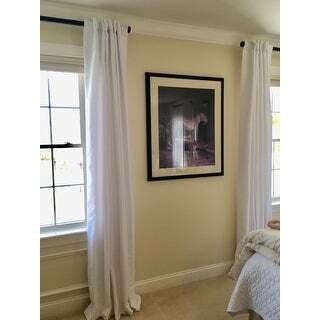 The picture of these drapes shows them being hung by curtain rings. When you receive them you realize that this cannot be done. I do not understand why you would show a product one way when it cannot actually be hung that way!!! I am extremely frustrated that I have to pay to return these. These curtains are stunning! True bright white which is what I wanted. They are made extremely well and look just like real silk! I had bought some real silk ones at another store for almost $130 per panel and the overstock ones are even better! I'm impressed by the perfect seams and weighted bottoms. Also, most faux silk looks too shiney and plasticy but not these! They have a small sheen to them which makes them very elegant looking. The lining is true white so the don't change to any tone of yellow or beige when the sun hits them. They provide perfect privacy without being blackout which keeps the house somewhat lit when they are closed during the day. So happy I decided on these! These curtains are beautiful! They hang beautifully and make the master bedroom look luxurious! They look and feel as good as real silk (but without the silk price!). The double lining makes them heavy enough to block out light (even though they are white). This was one of the best finds I have ever gotten from Overstock. 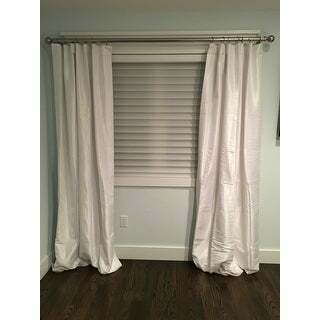 I don't usually write these reviews but these curtains are such a great deal that I wanted others to know they are worth the money. These look almost like silk. We purchased several panels and my only regret is that a similar item was sold in a blackout option. That one is really thick and well made. We purchased those panels in the Robin's Blue color for another room. Gorgeous. These are lined, and light filters through, giving you light and privacy. It too is constructed well. Overall, live these and the blackout option. 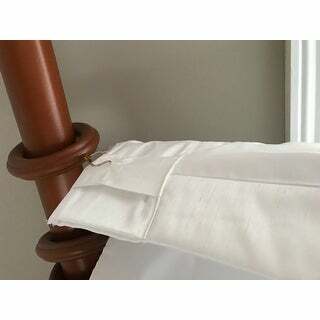 We purchased on sale, and appreciate finding a faux silk that looks like the real thing and hangs well without the expensive price tag of real silk panels. 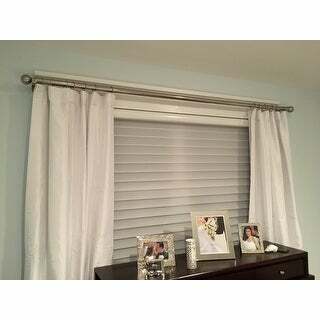 These drapes are really pretty you can hang them directly on the rod or with ring clips. 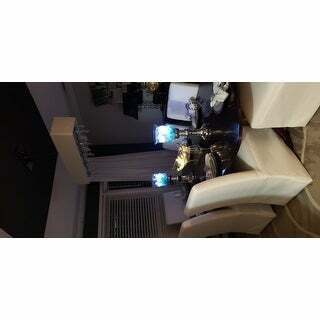 They look like expensive silk drapes and the ice white color is perfect with my white crown molding. There is a sheen to the material. If you are doing large windows I would recommend buying 4 to 6 panels. I used ice white sheers with mine and it looks very shabby chic but, in a elegant way. I hung them in my dining room over a double circle head window and it looks awesome with my white white judges panels and english channel dark blue walls. Very Fresh! I purchased these panels for a bedroom after searching 'blackout". These are definitely not blackout. They are lined, but at 6:30 am my room was already so bright that sleeping was an impossibility. The color was also too white. I have a grey bedroom with white trim around windows and doors, and the curtain panels clashed horribly with my white trim. Completely different color of white. Another review said that they look and feel like real dupioni. NOT So! Don't be fooled. They looked and felt like a cheap imitation. I asked my husband what he thought after hanging one curtain, and he said, "it looks like the lining of a coffin." Not what I was going for at all, so back they'll go. The fabric looked cheap in white. It may be ok in another color. Also the cleaning directions weren't there. I was aftraid that dry cleaning would turn them yellow. Some dark threads were visible caught up between layers of fabric as well. Lovely heavy drapes. Bright white. Used garment steamer to smooth wrinkles (which should be expected as packing most fabrics will cause wrinkling). Walls in photo are a pale tannish yellow. I am returning these curtains, although I do love the quality of them. They fall very nicely and are nicely made. 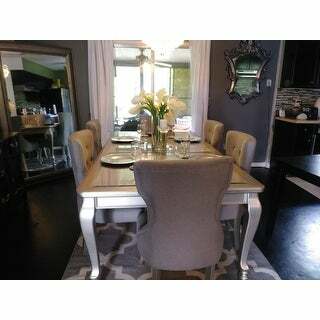 However, I wanted them for dining room french doors and I have a double rod hanging. Because of the white sheers behind them, they look ivory with the sun flitering through them. I really wanted white curtains because I felt it would make the room look bright and crisp, but it just didn't work. The picture makes you think you can use rings but there is no hook belt. The curtains are great other than that. Ice white is a true white and these hang beautifully. There are 7 tabs and also a rod pocket. They sent me hooks so I poked the hooks into the tabs (there were 7) and used rings as I had planned. Ordered more for my dining room. 5 star for the curtains but needed to get prospective buyers attention that the photo is misleading and you may be disappointed. Fantastic quality, great color, beautiful! I absolutely love these curtains. The fabric is high quality and thick...they look like special ordered designer curtains. They look fantastic in my home office which has a huge 10 foot window. Elegant and expensive looking. So pleased with the way the fit against my gray wall. Now if I could just make sure my husband don't dirty them, lol. These curtains turned out well and brighten up a small window. The texture is soft and really adds to the space where your eye draws close. I would recommend to get the right length and measure before buying as this material would be a tricky one to hem if needed. Would recommend. They are as described and look very sophisticated and beautiful. Beautiful! Looks just like real silk curtains! I have ordered so many of these. I even got some for Christmas from my mother in law! They have 3 layers to them. Heavy weights at the bottom. They are nice and thick. Definitely get you money’s worth. I love the Ice White on these curtains hanging in our livingroom!! They are very eye catching and go well with our gray walls. I think I love the length even more! We recommend these durable and lovely curtains!! I finally received my curtains and couldn't wait to hang them. The curtains are stunning and look much more expensive than they are. You cannot go wrong with these. Make sure you Measure your windows they do lay on your floors. Thick and luxurious. Look very high end. Hard to get wrinkles out because they are so thick. Definitely worth the money and would buy again. Although I liked this pair of curtains I did end up going with a sheer to acquire more light into the room. Nicely made panels that gave the room an expensive look. "Are these solid or is there a textured look with lines?" With a low sheen and visible horizontal slubs, this fabric has the look and feel of authentic, textured silk. "Is each panel 50 inches wide? Or would a pair make 50inches?" Each panel measures approximately 50 inches wide. "Can these curtains be hung with rings on a rod?" Hey Joyce! 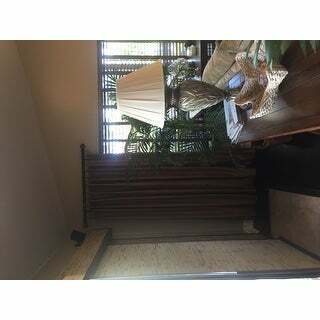 I have these curtains and they're great, at my last place I had them on rings. Now at the new place I have them hung by using the hoops on the curtain and they look even better! Enjoy. "I dont understand how to hang these with the dralery pins. Do you sell the pins, how do they attach to the panel?" You would need to buy the pins if that's the way you want to hang them. I have them on a rod pole; you can hang two ways with it. Through the tabs, or through the entire panel. I love them, be prepared to steam them to get packaging lines out. No, but they block a lot of light. Not entirely blackout, but they do block out a great deal of the light and the heat. Very few white or light colored curtains are actual "blackout". They can minimize, but that's it. "Could these be machine washed using gentle settting?" "Are these panels white on the back side, which would be seen from the outside of the house?" Yes, these panels are fully lined on the back in a soft white fabric and from the street show a true white against the window and/or sliding glass doors. Yes. They are lined in white cotton giving them a nice finished look from the outside windows. They are also weighted at the hem for a nice straight hang. I love them.